Grand Prize – Artistic Exploration: Awarded for artistic exploration and art works where appropriation by the arts has a strong potential to influence or alter the use, deployment or perception of technology. 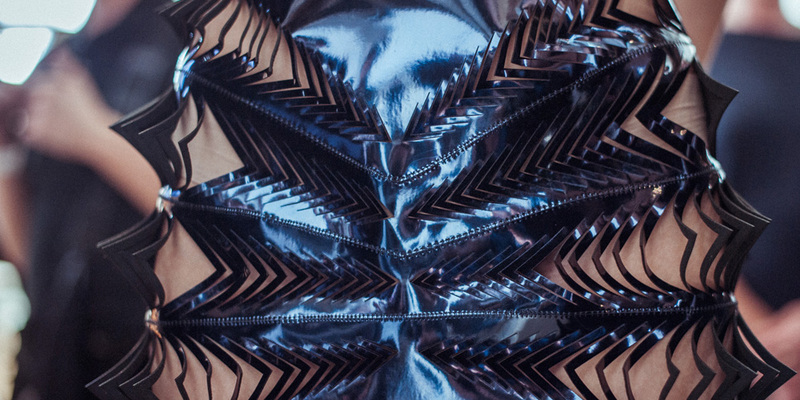 Iris van Herpen explores the interplay of magnetic forces. By thoroughly examining the representation of dynamic forces of attraction and repulsion, the designer fuses nature and technology. Earlier this year, van Herpen visited CERN’s Large Hadron Collider, whose magnetic field exceeding that of the Earth by 20,000 times, provided inspiration for Magnetic Motion. “I find beauty in the continual shaping of Chaos which clearly embodies the primordial power of nature’s performance,” says Van Herpen describing the essence of the collection. Van Herpen stayed true to her spirit of bridging fashion and other disciplines by collaborating with the Canadian architect Philip Beesley and the Dutch artist Jolan van der Wiel. Beesley is a pioneer in responsive ‘living’ sculpture, whose poetic works combine advanced computation, synthetic biology, and mechatronics engineering. Van der Wiel is an artist and craftsman whose work with magnetic tension has resulted in dynamic sculptures and installations that bring to mind the power of volcanic eruptions. Both artists strive to erase the boundaries between nature and technology in their work, which coincides with the direction of van Herpen’s creative aim. The designer worked with techniques like injection molding and laser cutting on maze like structures, 3D printing and intricate architectural handwork on dresses, jackets, trousers, skirts, and blouses, giving them dynamic shapes and surfaces that echo the body’s movement. The three dimensional nature and the layering of the garments give them volume. Emphasizing light and shadow play, micro webs of lace both veil and reveal the luminescent glow of crystal forms, while triacetate feathers punctuate the soft drapes and volumes. The controlled structure of the clothes is offset by the chaotic structure of the accessories, where, due to the nature of magnetic growth, no two items are alike. The shoes, belts, necklaces, and clutches were “grown” using magnetic fields. Iris van Herpen (NL), born in 1984, is a fashion designer. She studied Fashion Design at ArtEZ Institute of the Arts Arnhem and interned at Alexander McQueen in London and Claudy Jongstra in Amsterdam. Van Herpen immediately caught the eye with notable shows. In 2007, she started her own fashion label. Iris van Herpen creates women’s wear collections. 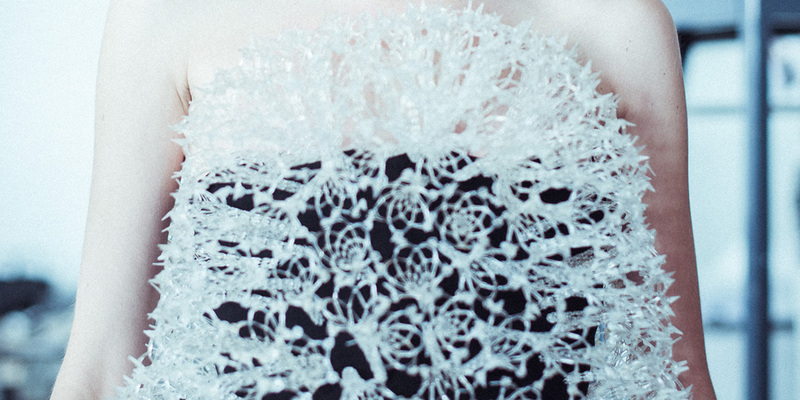 Her designs require every time a unique treatment of material or the creation of complete new materials. For this reason, Van Herpen prefers interdisciplinary research and collaborations with artists from various disciplines, often on a recurring basis. Since July 2011, she is a guest member of the prestigious Parisian Chambre Syndicale de la Haute Couture, which is part of the Fédération Française de la Couture. She participates in many international exhibitions and creates two collections a year. Her work has been recognized through awards, exhibitions, publications, and the mentioned guest membership.